Did you see the German Shorthaired Pointer win Best in Show at Westminster? He is a wonderful example of what German Shorthaired Pointers are made of: athleticism first and foremost, poise, intelligence, intensity and energy. His showmanship did not happen overnight! This dog has been training since he was a puppy! GSPs are very brainy, and very HIGH energy dogs. To harness that intensity takes a soft touch and a LOT of patience, and his owner is VERY experienced in this breed. GSPs are very much family dogs. They prefer to lounge on the furniture, the nicer the better. They do not like to be separated from their people and made to live outside all the time. They can be VERY destructive if left to their own devices! Also, due to their hunting instincts for both fur and feather, they are not suited to apartment living. GSPs need ample space to stretch their legs and let off steam DAILY. This means a large, securely fenced yard or multiple daily runs/walks are required. A GSP that has not had sufficient exercise will literally “bounce off the walls”. Think that sleek short hair equals low maintenance? Well, sort of but they still shed. They have slightly oily skin that causes the dark hairs to STICK to the light furniture and white hairs to STICK to the dark furniture. This can be reduced with regular grooming, but no dog is ‘ maintenance free.’ Also, due to the oily skin, GSPs have a distinct aroma about them, probably inherited from the breeds that gave them such awesome hunting instincts. GSP’s are bred to be hunting dogs, but did you know that they are good at other things too? GSPs excel at many activities: agility, running,tracking, running, flyball, running, obedience, running, swimming, and did we mention running? If you had grass before getting a Shorthair, you won’t for long! They wear the grass down by sheer volume of foot traffic. It is highly recommended that all GSPs go through basic obedience training, lest they drag their owners along on a running jaunt! The Standard calls for a medium sized breed with males to be 23 - 25" at the withers and weight 55 to 70 lbs and females 21 to 23 " at the withers and weight 45 to 60 lbs. Not all GSPs conform to these heights and weights. It is important to understand that GSPs are a very energetic breed and pound for pound very strong in spite of their apparent size. Considered a very athletic, lean and muscular dog with the majority of their body weight attributed to muscle. The average longevity for the breed is 10 to 12 years of age. A relatively hardy breed many live to be 13 years with some even longer. Considered seniors at or around the age of 9 some may require a change in diet or activity level because they will continue to try to work like they did as a younger dog. It will depend on their age and activity level. All GSPs should be fed a well-balanced food designed for active dogs that usually contains a higher fat/protein ratio content in addition to essential trace vitamins and minerals. Puppies and developing young dogs should be fed a diet developed specifically for their needs. Depending upon its age a young GSP may require feeding more than two times in a day. It is recommended to use the same type of dog food and follow the feeding schedule used by the breeder. Once they reach adulthood being fed twice a day; AM & PM is sufficient. Adults may eat from 2-5 cups of food a day, depending on their individual metabolism and activity. A dog training hard or hunting in cold weather will require substantially more than one simply going on walks and sleeping on the couch. A GSP that lives outdoors in a cold climate will need a diet specific to their needs during the winter because they do not have the type of coat nor layer of fat like some breed to insulate against the cold therefore, they lose a lot of body heat even when sleeping. This may require increasing the amount of food with each meal. Because the breed is subject to bloat or torsion they should not be fed immediately after running or other demanding exercise nor should they be allowed to run or exercise for at least an hour after eating and drinking. The ideal evening mealtime would be after the day's exercising and activities are through for the day. The Breed was not developed to be kennel or pack dogs but to interact with their owner and family. 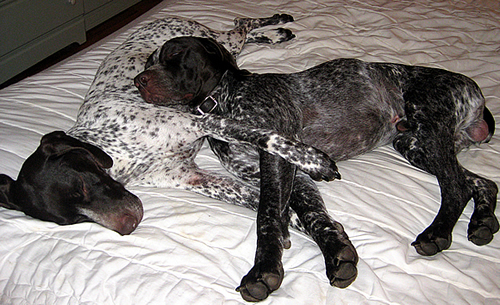 A GSP that gets a lot of exercise and interaction with family makes a great housedog. If not in training or hunting they must have a secure area to exercise or be taken on regular runs where they can let off steam. A GSP that is not exercised regularly will find a way to release pent up energy regardless if kept inside or outside. Crate training is recommended for various reasons. It helps with housebreaking the puppy and allows the adult dog a defined place to sleep and be confined when not allowed controlled freedom in the house. Because of their curious nature and high activity level, it is best if young dogs sleep in a confined, secure place, such as a crate. This assures that the dog does not “accidentally” get into trouble during the night when he wakes up and is unsupervised. Older, mature dogs that have proven themselves trustworthy housedogs, can be allowed to sleep unconfined at their owners discretion. GSPs may be kenneled outside if provided adequate shelter, bedding and water but they will not be ignored. An ignored GSP becomes a bored GSP and a bored GSP becomes a destructive GSP. Much like the bright student that gets into trouble because of boredom in the classroom the same can be said of the bored GSP because of its high intellect and curious nature. This bored behavior can result in barking, digging, chewing and overall general destruction. If a GSP is going to be an outside dog, their owner needs to be aware that a dog left to their own device can be extremely destructive. Maintenance of the GSP is minimal compared to many other breeds, but there are still some areas that require attention. The ear because of its shape and fold it doesn't allow for adequate airflow thus providing a warm moist environment conducive to yeast infections in the ear canal. Your vet can demonstrate proper ear maintenance to you and regular cleaning with mild solution, designed for ears, will help keep this area under control. Good dental health is a must. The family dog can be taught at a young age to have its teeth brushed with a toothbrush and toothpaste formulated for dogs. Under no circumstances should one use toothpaste formulated for people because it contains an ingredient harmful to dog. Also, provide chew toys that are designed to clean teeth and stimulate gums. Don't give hard bones or processed hooves as they may cause damage to the teeth of dogs that chew aggressively. Toenails should be kept trimmed. Long nails can be hazardous to the dog running in the field or in the kennel run by getting caught in something and possibly torn off. Besides bleeding profusely the dog's foot will be tender and sore until the nail grows back. A puppy can learn to have its feet handled at a young age and its toenails trimmed. It is best to do them once a week and remove only a small portion from the ends being careful not to cut into the quick. Also, if the toenails are long it can affect how the dog walks and bears weight. Shedding……YES, being a short coated dog does not keep them from shedding. The dark hair shows up on the light stuff and white hairs on the dark stuff!! Also because of the hair length it can become imbedded in some fabrics and carpeting and difficult to vacuum out. Regular brushing using a rubber horse brush or grooming glove along with periodic baths will help to some extent. Like some other breeds GSPs will "blow" coat depending upon climate changes and hormones. It is best to use a mild shampoo or one formulated for dogs so as not to strip essential oils from their coat. One also needs to be careful to keep soap or water out of the ears and eyes when washing the head. A good quality, balanced food with essential fatty acids will help to keep the coat healthy and may help reduce shedding. A healthy, parasite free, clean GSP will shed the least possible. Outdoor dogs living in colder climates will develop an undercoat that looks and feels soft and will shed out in the spring. This undercoat can be encouraged to all come out at once by closely timed baths and brushing as the weather begins to warm. Some GSPs may have loose lower eyelids(ectropian) that do not fit tight against the eyeball. Not a desired attribute because it allows dirt, dust, weed and grass seeds to come in contact with the eye. Grass and weed seeds can be very painful and may cause damage to the eyeball. When hunting with such a dog, it is recommended that you carry saline solution to flush out the eyes periodically during the day. GSPs were bred to be hunting dogs and as such require daily exercise. If they are not in an active training program then a daily routine that includes some form of exercise preferably morning and evening. The ideal would be time to run and/or play in a secure fenced area; at least a half hour AM and PM. If you do not have the facility for that a brisk morning and evening walk or jog are essential. Swimming is also a good form of exercise. City dwellers may have to be more creative with providing their healthy high energy GSP a daily opportunity to blow off steam and stay in condition, maybe a treadmill type dog jogger, or a local dog park where a ball or frisbee can be safely chased. A sturdy collar with clearly marked identity tags and two different lengths of leashes. One for keeping the dog close to one's body and the other to allow the dog a bit more distance away. A retractable lead, i.e. the flexi lead is fine as long as the individual understands it can be dangerous to both the dog and owner if used improperly. The flexi was designed to keep the dog close by with the lock feature "on" or "off" with the recoil feature active to allow the dog to move further away. The dog should not be allowed to wander about and become entangled in the cord because the recoil is not activated nor should the dog be allowed to run and hit the end of the flexi with full force as the cord can break or the handle jerked out of the hand. Flexi's were designed for different weights and it is important to have the correct one for the dog's adult weight even when using with a puppy or young dog. Dogs need to "checked" and not allowed to hit the end of the lead at full stride. One should never put their dog's name on the id tag. Should the dog be taken on purpose the person will then know its call name. The id tag can simply be marked, "I'm Lost" or "Please Return" along with a contact number. Dogs should always wear some type of collar and identification when outside even for short periods of time in their own yard. It is best if the dog has a microchip implanted under the skin between the shoulder blades and registered with the AKC’s Companion Animal Recovery program. The microchip is about the size of a grain of rice and contains all of the necessary information to contact the owner should the dog become lost. Most vets, shelters and other like type organization have a universal scanner to check for microchips. It is recommended to have the microchip implanted by a Vet or an agency that does this on a regular basis. Be careful of loose fitting collars and dangling tags when the dog is confined to his crate or running in the field as there is the possibility of it becoming tangled or caught on something causing harm to the dog. A “choke style” collar should only be used in specific obedience training situations and never used when the dog is off lead or out in the field hunting. Only snug fitting flat collars with a flat id tag attached by rivets should be used in the field. Be prepared to buy more than one type and size of collar to allow for the growth of the puppy into the adult sized dog and the type of training. A stainless food bowl and water bucket work best for a couple of reasons. They don't break are easy to keep clean because the surface doesn't harbor germs and won't cause contact dermatitis like some of nylon or non- ceramic bowls. A crate is a must. It should be large enough for the dog to stretch out and stand up and turn around but not so large that it does not provide the secure “den” feeling that dogs instinctively seek. There are various types, wire and plastic. Different situations call for different crates, be sure the crate chosen has a secure method of fastening the door so it can't be pushed open. Wire affords good air circulation, but is not as secure to the dog as a plastic crate. Plastic crates are required by the airlines should there be a need to ship the dog. Bedding that can be easily washed. Some looks really nice but if the dog has an accident it would be difficult to clean properly. Plastic backed items may work well as a moisture barrier but can also retain heat and be uncomfortable for the dog. Most GSPs like to retrieve and enjoy anything they can fetch including items you may prefer they leave alone. It is a good idea to teach your dog early to chew on the ones designed for that purpose and leave the others alone. The market is full of products good for helping reduce tarter on their teeth that can help maintain dental health. Dogs may have a preference of which ones to chew and not all dogs may like to chew on these types of things and may need encouragement. Some dog treats such as rawhide bones and rope toys should be given to the dog only with supervision. These types of items can be dangerous if the dog eats them rather than just chewing them. Some dogs take their time and simply enjoy chewing, while others simply destroy them swallowing large pieces that can become lodged in the intestine creating a dangerous situation. Puppies should never be allowed to play with or chew items unsupervised. It is also important to account for all of the toys regardless of age when the dog is through playing with them. For the most part the breed enjoys a reputation of being good with children. If considering a puppy or older dog it is important to ask if it has been socialized with children as well as adults. Due to their high level of intelligence and inbred desire to function with and for people they seem to understand that infants and very young ones need care and protection, and tend to be tolerant of little ones’ play. This is not to say that an exuberant pup will not knock a toddler down or accidentally bite when trying to grab a toy. When visiting a new litter, you may find the dam protective of her brood, and should respect that for what it is and never approach the whelping box unless the owner is present and in control of the mother dog. You also may encounter a GSP alarmed at the antics of small children, which should be explainable by asking if the dog has ever been exposed to youngsters. Aggression toward or fear of people of any size or age is not typical GSP temperament and should be avoided in any dog you may take into your home. Yes, IF you keep the lessons simple and consistent. If new to the breed it always helps to work with another knowledgeable individual. The GSP is very eager to please and will work hard for positive reinforcement. They are not generally stubborn or hard-headed but can be quite creative. They pick up new exercises very quickly. Due to their high intelligence level, the biggest challenge is to keep them focused, and not let them get away with “inventing” variations to the exercise being taught. Because of their extreme sensitivity to people, the trainer must always be watchful of their own body language and reactions to issues that come up during a training exercise. As a general rule, a calm demeanor providing quick and clear reward for desired behavior, while ignoring or if necessary simple verbal correction of undesired behavior will net you an enthusiastic and talented working partner. ABSOLUTELY!! The crate was designed with the GSP in mind!! If introduced properly and in a positive manner, it becomes a safe haven and a secure “den” for the dog. This way the dog has a place to go when things get too hectic and it needs a break. When the dog has to travel, its “home” can come along and the dog will always have a safe place regardless of the circumstances. Just as you wouldn't leave a very bright three year old child unattended the same analogy could be used about leaving an unsupervised GSP alone in the house and expect it to be good!! No one likes surprises and an unsupervised child and or GSP can be full of them if left to their own devises. When left safely in a crate,(hopefully not the child) when you come home, you know that you can enjoy your dog without the trauma of a big unexpected mess. Last, but certainly not least, if your dog is ever ill and required to be "crate rested" either at home or at the Vet's office, it will help with recovery time if they are familiar with a crate rather than the feeling of being trapped in a cage. GSPs are most commonly thought of as prized hunting companions, but what the avid hunters who treasure them know is this is not just because they have fantastic noses, tremendous endurance, great heart and strong field instincts. This breed was developed with versatility in mind, and the German breeding programs succeeded admirably at what they set out to do. They are also bred for tracking, for companionship, for watching over their territory and ridding it of vermin, for working in rough terrain both on land and in water. What is not fair to this breed is to ignore them and sentence them to a sedentary life with limited human companionship. If you can find activities in your life that afford the dog the opportunity to work with and for you, you will have a happy and well-adjusted animal no matter what that activity may be. The temperament, physical and intelligence qualities you read about in this piece allow the GSP to excel at just about any activity you are interested in which can include a dog. The coat pattern of GSPs can be quite varied ranging from solid to one with markings. The coat color of the purebred GSP will be liver and white or black and white but not a combination of liver, black and white. Some shade of liver may be very dark but the color of the dog's nose will indicate whether it is a liver dog i.e. brown nose for a brown dog or black nose for a black dog. BUYER BEWARE: One may see advertisements for "rare" GSPs based on color. One should approach these advertisements with caution, because the responsible breeder understands there is no "rare" colors found in the breed. There is a mutant gene that can result in a dilute silver or lemon color. There is a DNA test available to prevent these colors and reputable breeders will not produce dilute colors intentionally. Currently the Parent Club breed standard as written does not allow for the black variation to be shown in the conformation ring but that does not preclude the black version from being registered with the AKC or to compete in all of the performance events, i.e. field trials, hunting test, agility, obedience, and tracking. At a minimum, breeding stock should be certified against hip and elbow dysplasia by the Orthopedic Foundation for Animals (OFA)with a ranking of normal for elbows and at least good or excellent for the hips. Some breeders may use PennHIP as a means to assess the hip joint and the amount of laxity both of which can be a predictor of future hip health problems. GSPs rank 107th in hip dysplasia with only 5.3% of the Xrays submitted classified as dysplastic. This data is skewed by the probability that most bad Xrays are never submitted to the OFA, which makes the certification all that much more important. There is also an eye clearance through the OFA Eye Certification Registry which checks for juvenile cataracts; another genetic eye condition Cone Degeneration (CD) can only be cleared by a DNA test. A dog can be determined to be a "non carrier and/or normal", a "carrier" or an "affected". Normal means just that, the dog doesn't carry the genetic disease. A carrier has one half of the genetic material to produce the disease but does not have the disease. Affected dogs have inherited both halves and will exhibit symptoms of the disease which causes the cone receptors in the eyes begin to degenerate and by the time pups are 9wks of age the breeder would begin to notice these pups have a problem with depth perception, seeing comfortably during the daytime and difficulty locating a light colored object on a light background. Termed "day blindness" which is a misnomer in that the dog is not "blind" just that it sees better in low light conditions. Some will also have thyroid levels tested; test for Von Willebrand’s Disease (VWD) a blood clotting disorder; and have heart function also cleared through the OFA. It helps to know the health not only of the sire and dam of a litter, but also of their parents and littermates. How long did they live? What if any kind of health issues did they have?